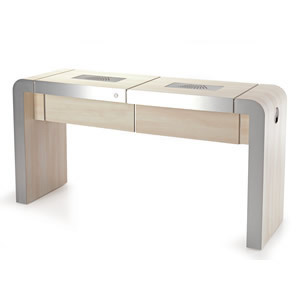 REM Concorde 2 Position Nail Station, stylish nail station available in any colour from the REM range with Alu Brosse trim as standard. An Advanced Air Filtration System is fitted as standard, the new filter system has been designed to take into account rising Health and Safety legislation relating to the purification of air in the working environment and to noise levels deemed to be safe by the Health and Safety Executive, new filter system is carbon activated particle & odour filter to catch particles as small as 0.3 microns to 97% effectiveness, the system also moves air at a rate of 1.00 - 1.20 meters per second at the working surface and to a decibel reading of 60db seated, well within the H&S recommendations. standard, also fitted is a Cable Management System. Electrical sockets can be fitted as an extra, please ring 01270 630280 for pricing. Sizes width 157cm, height 80cm, depth 50 cm. Laminate colour in pictures is Blonde with Alu Brosse Trim fitted as standard.